The recession seems here to stay and work is slowing down. Coupled with winter, things are tough. I am turning more and more to what is in my freezer. I often put things away for a rainy day, and the rainy day has arrived, both literally and figuratively. I love the rain – as long as I don’t have to drive in it. I love knowing that my herbs are getting a good soak, that my grass will be greener afterwards and I am hoping that the rain will bring with it a growth of my bougainvillea. But, while it is raining the builders cannot build, and if they cannot build they are not buying material. Some of my customers have not purchased items from us for 3 months. They are quiet and I worry for them. I worry they will not make it through this recession. Each day I see another TO LET sign on the door of a company that has closed. I am grateful we are still in business and that we will still be open when times are better. I am making a concerted effort to see what is in the freezer before I start cooking. This week I found some pasta dough and turned it into hand made farfollini. 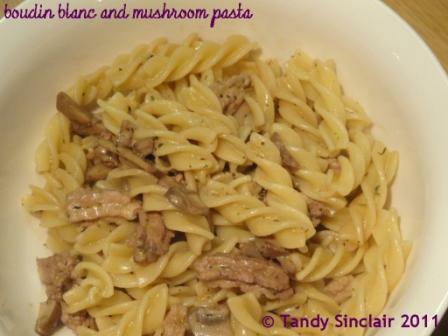 For this pasta dish, I made use of the left over boudin blanc from my monthly mingle post. The photograph does not do the taste any justice but at least I know I made good use of something I might have rather left for another rainy day. Tandy, thanks so much for such a great dish, especially perfect for touch times like these. Enough to put a smile on anyone’s face. I’m very impressed with your homemade farfollini – I’m happy when I just make plain, straight pastas! Thanks for being such a super PPNer. I’m always excited when I see you join the party. Tandy, this pasta dish is just perfect for a weekday dinner. Celi sent me, I’m reading her fun challenges post. So glad she did, this looks silky and simple. It’s just perfect. It’s scary when everyone around you starts struggling! I’ve definitely canned and frozen more food than ever before this year–and broke out some of my tomato sauce last night. Now I just need to tackle making my own pasta! you won’t regret making your own pasta – it tastes so great! I don’teven want to think about business and how bad it is at the moment! it is so scary Pink, I know a lot of companies are really struggling! Pasta dishes are simply good old comfort food for me. I’m impressed that you make your own pasta dough; definitely a good way to save $$ and taste so much better. I’m cooking very simple these days too and honestly I enjoy these no frills dishes! It really is tough times for us all – not fun! It seems like it’s just getting tougher everywhere. Really like that you posted about using things up. In tune with the times. Fingers crossed for us all. I’m making a concerted effort to use what’s in the freezer too. And use up all those half tubes of face-cream in the bathroom! But I fear the recession has barely started here. Sometimes having to make economies makes us more creative…look at this gorgeous recipe for example. Hope things soon start to get better for all us! I think we are all feeling the pinch these days. it is quite scary Sue! How is the dude? I hope you do get paid! It is not right to have someone do work for them, and then not pay!